When I was in my teens and started to learn about fixing computers, one of the first thing I remembered learning was the proper order to install drivers. Installing Windows now is much more simplified and easy compared to Windows 95/98 because we don’t need to use a DOS bootup floppy disk, and the vast support of devices on Windows 7. Windows 98 didn’t support a lot of drivers and we need to spend quite a lot of time searching and downloading the drivers for chipset, display, sound, modem and printer on the internet using the slow 56Kbps dial up internet connection. A very old friend of mine just called me yesterday asking me what and how to install chipset driver. Many people call it a chipset driver but in fact it is not a driver nor does it include drivers. It contains information text files (INFs) that provides the operating system with information about a piece of hardware on the system. This allows the operating system to show the correct name for that piece of hardware in Device Manager. As far as I can remember, the first driver that I should always install is the chipset drivers once Windows installation has been completed, followed by the rest of the drivers. If you install the Intel Chipset Software much later, you will notice that it will not install all INFs. First you need to make sure that you have Intel chipset. You can run Intel Driver Update Utility which uses either ActiveX or Java to scan your system. Once the product detected shows that you have Intel chipset, then “manually” download the latest version of the Intel chipset software. You will notice that the Intel Chipset software installs more INFs compared to just running the setup alone without the -OVERALL switch. Always remember the saying “if it ain’t broke, don’t fix it”. So don’t update your device drivers if everything is working well. Please help! I have installed the chipset and every time it scans, it says it needs the same update. Why is my install not “sticking”? I am not sure about “most of the time” but there are times when “chipset drivers” need to be installed for proper operation. The inf files tell the OS HOW to “configure the the Intel(R) chipset components” to quote Intel. I take that to mean letting the OS know the capablities of the H/W and how to talk to it. From personal experience I have seen a replacement server not function properly because the wrong “chipset drivers were installed. Chipset drivers are needed. Always install them. Always get the latest ones from the motherboard manufacturer’s website. This is more than just a proper name! The chipset drivers are exactly what the name says: drivers for the main chipset which is the heart of the motherboard. 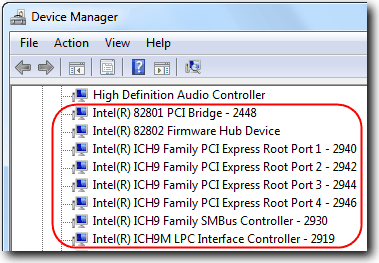 PCIe bridge, DMA controller, USB driver, and other very important chipset functions. hi mr ray…. i wonder if you can help me.. i want to install windows to my pc.. what software do i have to install to make my pc fine such as reader, utility, player etc… thanks..
Raymond, there is a problem with this trick… INF will fully install but after this you will receive an error if you try to installa Rapid Storage Technology driver. I don’t have Intel Chipset but I really value this article which it helps many people to find a solution where it seems ‘it’s no solution’. I still use Win 98 Bootup Disks for Formatting Drives larger then 32 GB…….. And Sir Please kindly Give me some tips for Blogging. Thanks for this useful trick Raymond!!! Thanks for the tip Raymond. Its always good idea to install the chipset drivers because in some case you get devices showing a yellow question mark because the Operation System doesn’t know who to handle the device.